The South Pole: Solo but not Alone: Day 35.9! : I've arrived at the Bottom of the World! Day 35.9! : I've arrived at the Bottom of the World! I'm HERE at the South Pole, I honestly believe it hasn't hit home yet! I'm actually at 90 degrees South, but not sure Google Earth / The Diary can deal with 90 co-ordinates, so the 89 above! 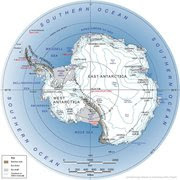 At 11h55 Punta Arenas time (GMT +3) my sled finally came to a halt at it's destination: The South Pole! It took me almost 6 hours today, in almost 'dream' weather, clear blue sky, not too cold, but that headwind was 'just there' reminding me what yesterday was like... I was thankful that I'd mentally prepared for the fact that it would take six hours to get to the place my mind had almost checked out that 'we' were already there... It was a pretty relaxing ski, and to my total I spent almost the whole time reliving the two wonderful years I spent in 1984/5 (long time back!) living and working in Princeton, USA. I guess the linkage with the US base here is what triggered the whole thing. Anyway, thanks to that my mind was very relaxed, content with the special memories, and the kilometres sped by! In many ways I was dreading the six hours, as it was so close yet so far, and I was 'scared' how I'd deal with that conflict, and the relief prize awaiting! It's strange how the mind can sometimes take one by surprise. The approach to the 'complex' is quite strange for what it is... There is this huge ice road that is virtually an ice highway, maybe 30 metres wide that I'm told runs the whole way from McMurdo base on the coast (opposite side to where I started) to the South Pole. I was given a waypoint that was a flagged beacon sticking 4km out in the middle of nowhere, but a 'T junction' into the highway... Hmmm, back into civilisation - roads, rules, instructions, and man made infrastructure! It did bloody stress me... I saw where I had to go, started cutting the corner, and then looked back and said: "Hey you have a very clear sled/ski trail telling 'people' where you went, and it's against the instructions, so there are no disputes here, you had better go back and do it properly!" I didn't, but I did feel I was back in a 'policed' environment! I know this sounds overboard, but I'm sharing with you my genuine reactions after being totally free for 35.9 days! Anyway, I 'yielded' at the intersection, as there was no 'highway traffic' in sight, turned 90 degree right and was now on the highway myself... 4km to go to the finish line... hmmm, still another 80 mins, yet everything looks so close... but I'm wiser now! It was quite fun, as I skied in a snowmobile trail, straight and fast. Eventually there was a '20 km/h Speed limit' sign, and then a few small tents and another sign: 'Campsite'... 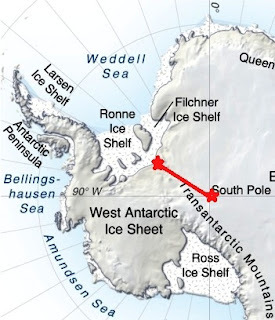 I was there... well a few hundred metres to the actual South Pole point, but this is where me and my friend 'sled' stopped our 'joint' journey... Forever? We shall see, but at least for 'a long while!' At least we are still good friends 'she' did well the last weeks. You made it to the South Pole. Never thought that we would know someone that would go to both the North and South Pole. This is really a great accomplishment !!!! Could say a hell of a lot more - 'Well done Boet' will suffice - looks like it is time for yet another liqueur - hope you can find one there too. I wonder, are you looking forward to kiting back now? Congrats Fairbanks, what a journey. Have a few glasses of wine for all your friends that have been following the trip.Hope to speak soon. Wow at last! Congrats Howard. Completely in awe! Huge Congrats Howard ... lost for words ... just an amazing feat & thanks so much for having me along for the ride. I don;t know how you do these things, but as others have said, feel very privileged to know you, and humbled by what you've achieved. Enjoy the "luxury" of the base, & Ruth's arrival. WOW, Congratulations for seeing through such an arduous journey, you are an inspiration to all of us. Unbelievable!! Huge congrats Howard, been following you all the way on a truly remarkable journey - enjoy putting the feet up and of course a red or two!! Howard.....YOU HAVE DONE IT!!! (Not that anyone who knows you ever doubted it). Warmest congratulations (from Kathleen also)on a fantastic achievement that should deservedly put you on "top of the world". You have proven that when the spirit is strongly willing the flesh is not weak. Congratulations! Well planned, well prepared for and well executed. congrats H on an awesome adventure and achievement - especially one that so few have acheived solo and un-supported. Hooray Hooray Hooray!! You did it. Congratulations and I wish you a Happy New Year with more adventures. what a magnificent acievment!Proud of you and the way you went about it. Hope it sinks in slowly - must be a big shock to be in civilization and have riles,obligations and People around you. Dont feel under any pressure to kite back - what you have done is more than enough for 100 people.. Enjoy the buzz! That's sensational Howard! What an incredible achievement!!! Enjoy your sleep my friend! You deserve a good rest indeed! Congratulations Howard :o) Well done, sir. Great work and a great achievement. You set out to do it and you've done it. Looking forward to hearing about the kiting. Say "Hi" to Ruth when you see her. All the best from Kitevibe. Well done mate, Dan and amelia arriving tomorrow, we'll raise a glass to you!! Well done Howard! An inspiration to anyone, no matter how big or small their task! I am with you in thoughts, dear! Gonna take a glass of red wine with you!! Congratulations Howard on your epic journey and extraordinary achievement. All our lives will be richer (and hopefully simpler) for being able to share your experience and philosophy. Look forward to catching up over a glass of wine again in Cape Town. Howard, This is so awesome! Congratulations man! Take care of yourself and I really hope to see you at some point soon! Fairbonk you biscuit! Well done mate. I suspect it will take a while to decompress from this one. Enjoyed the journey thanks for sharing. Well done Howard! Helke and I are very happy for you. Have a nice kite session! Welcome Home Howard! I think the South Pole is a great home for you! You so deserve a really really good rest. My gut feel is that you would be better to forget the kite trip... you have done more than enough.. your body needs a good rest now..not more challenges.. let your body talk to you!! Brigitta and I so look forward to having a beer in St. James's or Kalk Bay and hearing more from you about the journey. But well done, man, and now just enjoy your well deserved rest and hopefully Ruth will be along in a few days to join you. I was smiling the entire time I was reading your blog today. "You're THERE Howard, you made it!!" Am I surprised? NO... Relieved that your struggle is over though (that's from my prospective, perhaps you prefer it). Sad that my "real" reality program is over. Happy that you accomplished what you set out to do. Happy that you shared so freely with your tag alongs and even let us have a dialog with you. Looking forward to your summary! Thank you, again, Howard, for allowing me into this riveting adventure! Rest. Sandy T. GEFELICITEERD!!!!! Well done Howard. Good to know you made it in good health. Well done ! Planning precise ..6 hours.Thanks for the honest thoughts.Interesting relationship with the sledge.Well done Howie,great adventure & achievement!Climbed Lions Head yesterday & thought about your tough situation for 36.You are in a special spot,mentally & physically..
Look forward to catching up & just listening...let us know when its good to go with the Book! PS-is the giraffe with you?Am sure you have a pick. Will you send us a blog on daily thoughts while you wait for Ruth, & the kite trip back if that does take place?Am sure another interesting adventure. What's its like out of prison with no guard?Have you found the master/skeleton key for a period of time? Love to Ruth & enjoy the experience. Congrats from your BJHS ESL South Pole Followers! What a trip and a time to reflect. You have given my students much to think about, much to be amazed at and much to keep them aware of the just how big the world is...and so small at the same time. Talk to you soon when we are all back at school. WOW! Congrats Howard! Your blog is very interesting and I'm glad you made it to the pole in one piece. Safe journey home. I look forward to reading about it. Well done Howard!!! My stress is over now that you have arrived safely. What an incredible achievement. Thank the Lord for keeping you safe. Congratulations!! That's great! Hopefully by now you have had a good rest, some more real food (and maybe even a shower...) and a catch up with Ruth. Well done to both of you. We are in Chamonix now, catching up with David, and we toasted your achievement over some very refreshing beers last night. We'll look forward to doing the same in person at some point soon. All the best for a safe journey home.